While the BJP fielded 16 new faces, denying nomination to two legislators and giving tickets to only three women, the saffron outfit is likely to axe about 40 MLAs in subsequent lists. NEW DELHI: Caution seems writ large in the BJP as the party took utmost care to address the caste conundrum in poll-bound Gujarat while releasing its first list of 70 candidates. The list included 17 nominees from Patidars, besides five Congress rebels who had bolted during the Rajya Sabha biennial elections. While the BJP fielded 16 new faces, denying nomination to two legislators and giving tickets to only three women, the saffron outfit is likely to axe about 40 MLAs in subsequent lists. “The first list of the BJP includes 17 candidates from the Patidar caste, which has emerged as a conundrum for the party, with Hardik Patel leading the agitation for reservation. The list also includes 18 OBCs, which include a good number from Thakor caste. There are 11 tribal and three Dalit candidates,” a senior BJP leader said. Evidently 49 out of the 70 candidates are from the Patidar, OBC, ST and SC block, which gives out the BJP’s strategy to take the wind out of caste youth leaders Hardik Patel, Alpesh Thakor, Jignesh Mewani working against the saffron outfit. While the first list gives a semblance that the BJP is sticking with sitting legislators, sources in the party advised caution in drawing any conclusion, saying that about 40 sitting MLAs would face the axe when names for all the 182 seats are out. 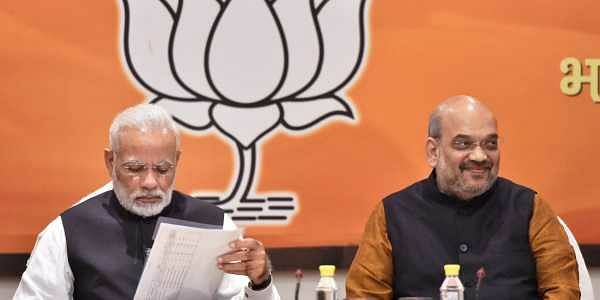 The first list of the BJP has seats that the party had listed as Category A (highly safe), which included Chief Minister Vijay Rupani (Rajkot West), Deputy Chief Minister Nitin Patel (Mahesana) and state unit chief Jitubhai Vaghani (Bhavnagar West). The saffron outfit has renominated 15 ministers in the Rupani Cabinet to contest from their respective constituencies. The shadow of Himachal Pradesh, however, threatens to loom large in Gujarat, as the party fielded only three women candidates—Ramilaben Becharbhai Bara (Khedbrahma), Manishaben Vakil (Vadodra), and Sangitaben Rajendrabhai Patil (Limbayat)—in the first list of 70 candidates. The BJP rewarded Congress rebels who had bolted when the party chief had launched spirited attempt to stall the bid of his arch-rival Ahmed Patel from winning the Rajya Sabha biennial elections. Five Congress rebels—Raghavji Patel, Dharmendrasinh Jadeja, C K Raolji, mansinh Chouhan and Ramsinh Parmar—found mention in the first list. Eight Congress MLAs had joined the BJP after the Rajya Sabha polls. The party is likely to accommodate three other remaining Congress legsilators. The Central Election Committee of the BJP in its meeting on Tuesday—which was presided over by the party chief Amit Shah and Prime Minister Narendra Modi—had given the nod to nominees for Gujarat elections. The first list consisted for 42 seats going to polls in the first phase on December 7 and 28 in second phase on December 14. The counting of votes is slated for December 18. The first list of the BJP clearly hints that the party is making a determined bid to block Congress’ attempt for consolidation of Patidar, OBCs and tribals by re-engineering the old KHAM (Kshatriya, Dalit, Adivasi and Muslims) formula. With Patidar, Koli and tribal constituting substantial chunk of the electorates in Gujarat, the BJP appears to have attempted to strike a right balance in ticket distribution in the first list. The BJP is expected to release the names of remaining candidates over the weekend, as the laste date for filing of nomination in the first phase is November 21.